September 25, 2018: If or when Deputy Attorney General Rod Rosenstein is ousted or steps down, Solicitor General Noel Francisco is likely candidate to step in and begin overseeing the Mueller investigation into Trump and Russia. Word is, Francisco has an 'expansive view of presidential power', which may be one of his best qualities as far as un-indicted conspirator Mr. Trump is concerned. As you see, his law-abiding Saturn in Taurus is 'conservative' and at Station Retrograde which strengthens and emphasizes his Saturn. Transit Venus in Scorpio is currently opposing his Saturn which marks a sobering time of 'business only'. Once transit Saturn eventually opposes his natal Venus (21Can14), partnerships and alliances will be under tremendous strain. Natal Saturn leads a Locomotive pattern (a ruthless drive toward success; a high-powered executive--Tierney) and is parallel royal star Regulus. See upper right for the stars in paran at rising with his planets, among them Sirius, The Scorcher. 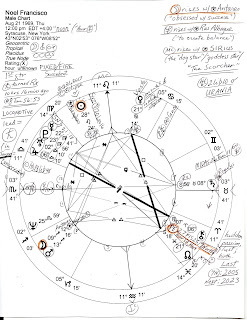 But today his natal Uranus 2Lib10 is spotlighted by the Sun (2Lib34 as I type) which points to a decision of whether to be part of a certain group or not; either way, Mr. Francisco receives special attention under this transit. 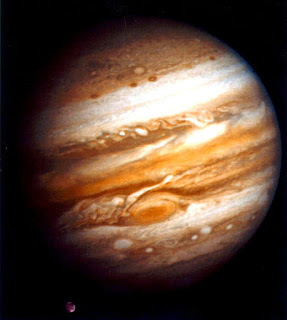 Meanwhile, natal Jupiter (6Lib10) is called on by speedy messenger Mercury (6Lib10--00:00 as I type) which denotes expanding ideas and plans, and engaging in political activities. Natal Venus in Cancer is oriental (last to rise before his Sun) denoting that he tends to work with things of value. 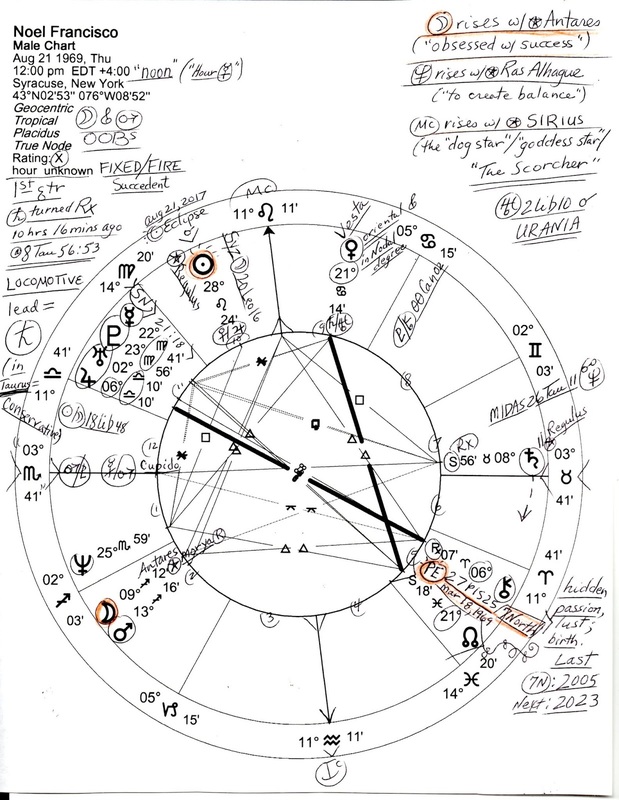 Noel Francisco's Prenatal Eclipse Saros Series is the 7 North and his PE is marked in orange on the chart with 7N eclipse themes listed, lower right. And of course, there's the massive pile-up of Mercury, Pluto, Uranus, and Jupiter across two signs (Virgo and Libra) for such are the births of late August 1969. A Mercury-Pluto conjunction suggests his dealings with secret and/or dangerous information, possibly with spying implications. It also hints of deep powers of thought, like a detective seeing through people and events into their deeper meanings and motives. Unfortunately, a desire for revenge often comes along with a Mercury-Pluto conjunction so Mr. Francisco may remind us at some point of the vengeful, retaliating Donald Trump--or he may simply take part in Trump's vendettas against his 'enemies', real and imagined. The rest of the dissociate stellium is formed by a Jupiter-Uranus conjunction denoting a man with an insatiable curiosity for rooting out the truth and a respect for knowledge especially that of intellectual giants of the past--and yet he himself is a 'futurist'. He's also an opportunist who never lets a chance go by without taking advantage of it and he gets quite a few chances with this conjunction of 'lucky breaks' and 'breakthroughs'. An interest, if not a talent, in Politics is also indicated although he'd do best to use his talents elsewhere such as in Education. 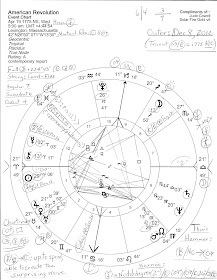 Plus, natal Mercury 22Vir41 is a writing-teaching-dedicated-work sort of placement, a book author perhaps, although his Mercury conjoins US natal Neptune 22Vir25. 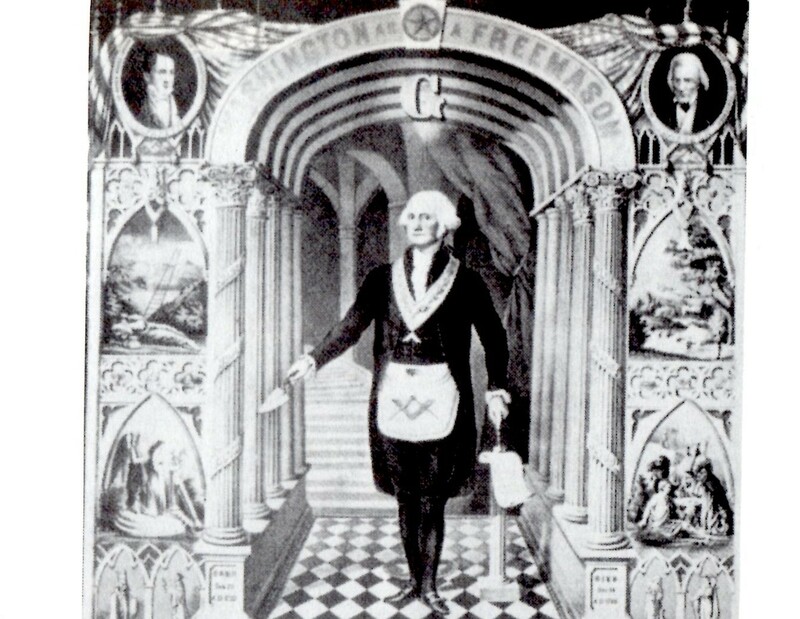 With this transit-to-natal consideration (1969 vs 1776/USA) a faint whiff of occultism may be noticed. So Who Is Noel Francisco? He's all that and more and his double Fire personality blend of Sun Leo-Moon Sag reveals him to be a passionate, adventurous hero-worshiper, an independent, restless, romantic visionary who is proud, loyal, and generous, yet can be imperious and impatient. A tendency to jump to conclusions has had to be re-directed or re-purposed and hopefully he has done this for his best results. He does lean toward dismissing the ideas of others out of hand and too brusquely which wounds far more than he intended. But why intend harm to others at all? "Two antagonistic influences...one to mount direct to heaven, the other to drive yawingly to some horizontal goal." For more personality blend details see Sun Sign-Moon Sign by Charles and Suzi Harvey ~ now on Kindle!